This image doesn’t show a train but does show why CN is quite interested in expanding its former DM&IR Lakehead storage facility (to the left) to handle limestone separately from ore. The Great Lakes Fleet tug-barge Presque Isle is loading ore at the shiploader while the Joe Block with its cargo of Minorca limestone is waiting to gain access to the unloading hopper. The Block had to wait at least 12 hours for the Presque Isle to clear. In the distance the Callaway is heading out of Duluth towards Two Harbors for a load of Minntac pellets after depositing Minntac limestone at Hallett Dock. When CN expands Lakehead the Block and Callaway will be able to unload at the same time on the south face of the expanded dock using their self-unloading booms and piling directing to the pad. Plus, the extra space will allow for both Minntac and Minorca limestone to be handled through Lakehead versus using Hallett. There is some discussion on the E&LS list about ore remnants being trucked to Sidnaw and shipped south to be used as pigment in paint. This has been going on for many years in small quantities from the Peterson Mine near Bessemer on the Gogebic Range (originally shipped from Bessemer on the Wisconsin & Michigan and then from the WC and CN north of town when the former Soo Line route from Mellen was torn up). I was curious if anyone knows if this is an old tailings pile they have been screening or if this was a large stockpile of ore from when the Peterson shut down in 1966? Here is a view from Dean of the current workings. This image was an afterthought given the primary target was the Schnabel car with a high-wide load out of the port. C&NW’s transfer (with light engines after dropping off at the Soo Line) was caught behind the slow moving load and patiently followed it to BN Rices Point until it could ease by on the double track. 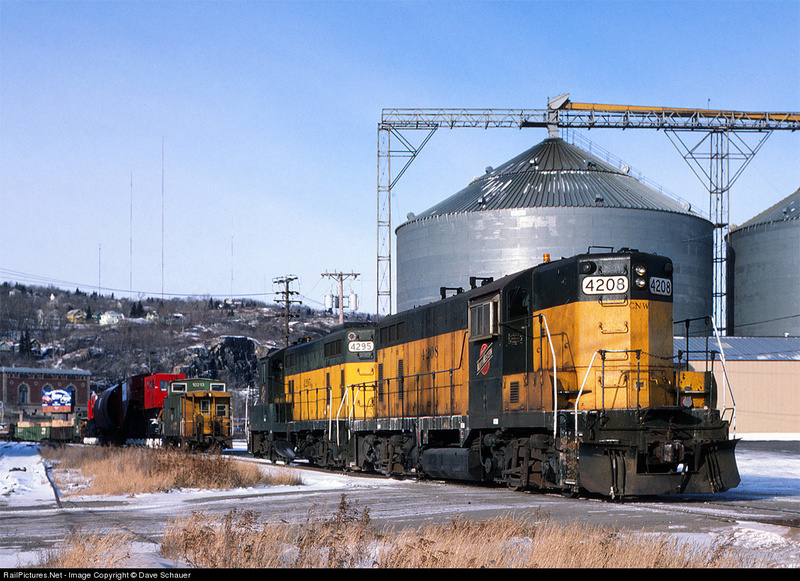 When most fans think of ore trains behind SD45s the WC comes to mind but two other railroads used those big burners locally on ore. One was BN, which assigned SD45s to the ore pool in the mid-1980s (many ended up on WC) and the other railroad was C&NW on then-new all-rail moves to Geneva Steel. They didn’t last long in that service but I happened to catch four together on loads at the old Boylston in 1983. They were impressive. Although gloomy and humid weather was the norm today spirits were high for volunteers of the LS&M as their first revenue passenger train in over a year departed West Duluth. Here the train rolls over BNSF’s new bridge just west of the LS&M’s loading area across from the Zoo. Gus wanted to play in the sand and rocks so I told him he had to wave to the train when it went by. This shot is on my list for this fall when there is some color and lower sun (the railroad runs through October 13). Read more about Welcome Back LS&M! Mel reports that the GEs NSM is leasing have not yet departed KC as of this morning but are in the process of being inspected by BNSF. Here is a shot of one of the three that NSM will be receiving for a 4-month test (as noted here previously on OreRail). NSM expects them to be on the property later this month. 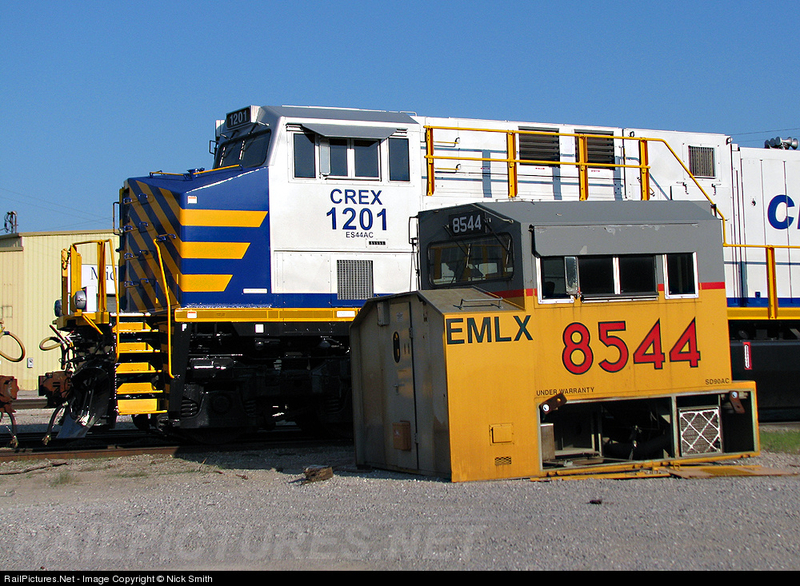 Numbers will be 1201, 1203 and 1204 (as they now sit at Mid-America Car). Not a bad paint scheme and it would be neat to see two on the point and one DP on the longer mainline trains. Given tight budgets and production cutbacks at Cliffs I doubt these are longer term players but who knows given the fact these have sat unused in KC for a long time and Citi might be interested in a very attractive lease. 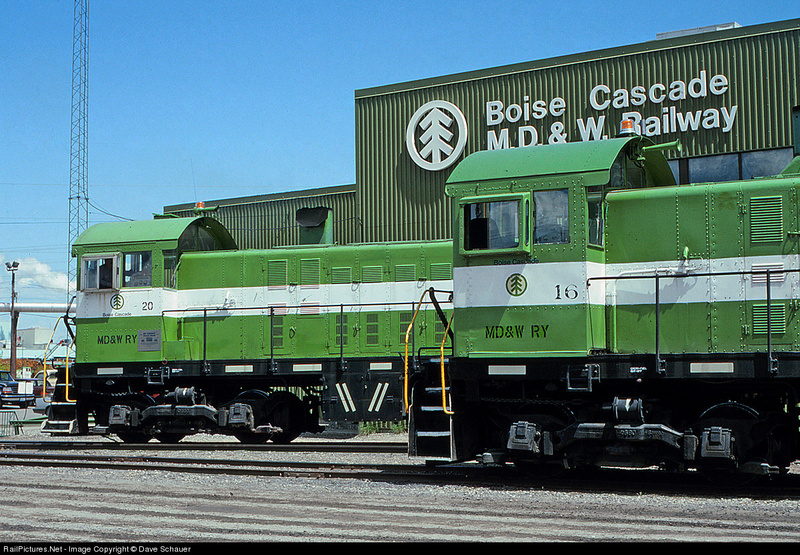 This shot was taken 20 years ago this past June and shows two the MD&W Alcos at their office/shop. I was there on business and the sun was high but the sky was blue and clear (the weather almanac says the high temp on June 4, 1993 was 72F with a dew point at 37F and the humidity 57% - a nice high pressure system). 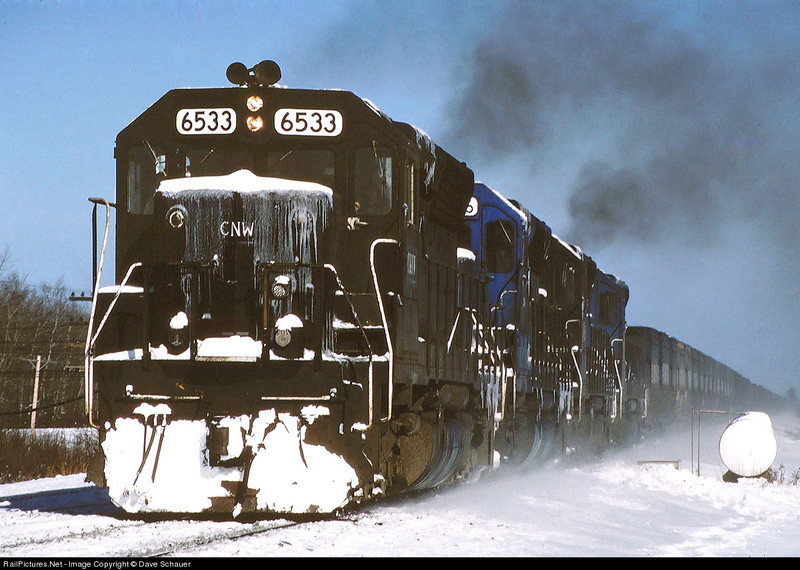 Credit SRG for the “Alcos in the Ice Box” moniker courtesy of an article he did for Trains. The “Ice Box” has been more like an oven this past week. 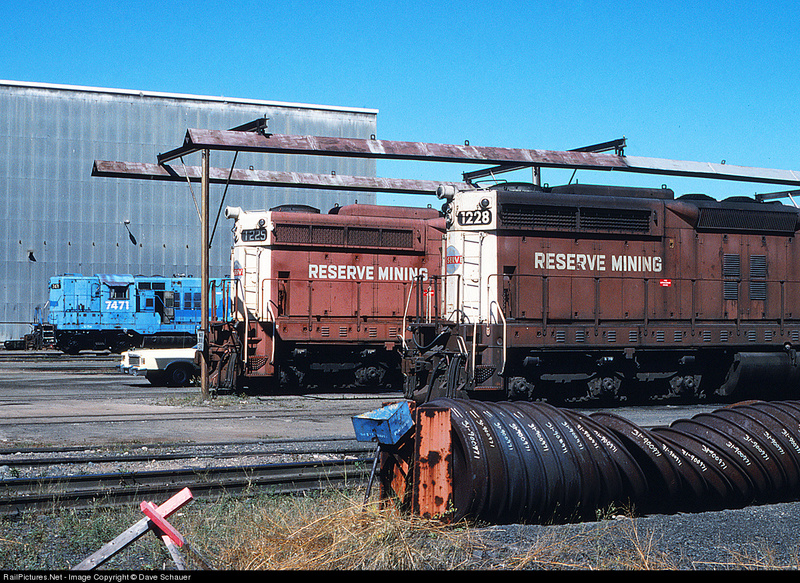 When Reserve Mining closed in the late 1980s due to the bankruptcy of some of the steel companies that owned Reserve many of us felt the mine and plant would never operate again. The trustee did make sure the facilities were winterized and that enough equipment was left so that mining could resume at a lower level should the operation be sold. Reserve ceased production in July 1986 but two possible buyers emerged in 1989 (Cyprus of Denver and Cleveland Cliffs). Cyprus, although with a lower bid, was awarded the former Reserve Mining property and operated its first train on January 5, 1990. Eventually Cliffs would buy the property when Cyprus decided to sell and concentrate on their core coal business. Based on an observation this morning DM&IR 403 is out of its usual road service rotation on the Iron Range Sub and was teamed up with DM&IR 212 on the E-Lead Switch at Proctor. It is facing south in the set so it is tough getting decent shots of it. I haven’t seen maroon SD38-2 215 in the past few weeks – it is likely in for work (hopefully, versus retirement). Now if only CN would team up the 215 and 403 on the switch job!